Here in New Mexico, the autumn equinox has brought a chill to the air and a change in the light that says summer has gone. I thought I would write about a few aspects of iris gardening in the autumn. Is it too late to plant bearded irises? 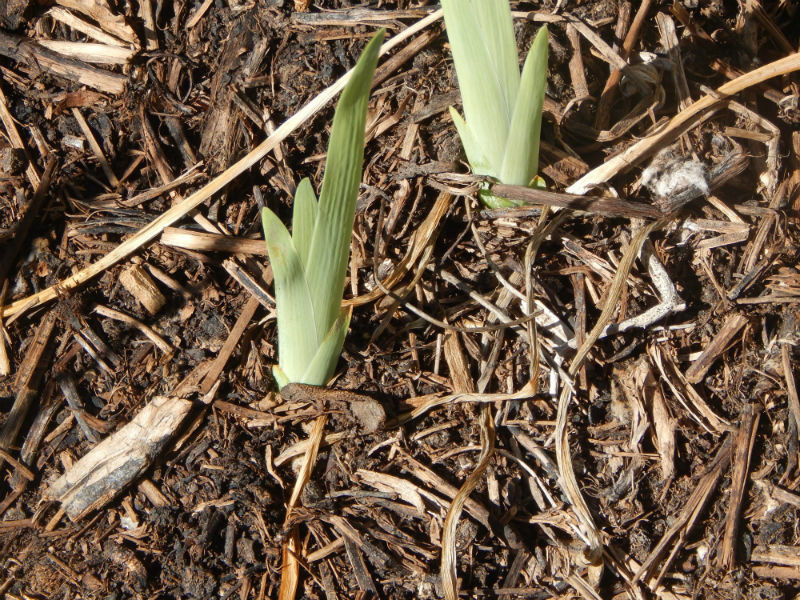 A good rule of thumb is that bearded irises should have at least six weeks to establish themselves before the first frost. Here, with average first frost around October 10, I certainly aim to have all my planting done by mid-September. Yet we've all been in situations where we get some unexpected irises at a sale or meeting or from friends late in the season, or just can't manage to get everything in the ground as soon as we'd like. 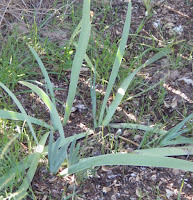 The good news is that irises are pretty resilient, especially in areas where winters are not too severe. I've planted up to the first frost date without losing many. Things that just can't be planted should be potted up and placed in a sheltered spot to overwinter. Should I trim back the leaves in autumn? but please don't cut them! 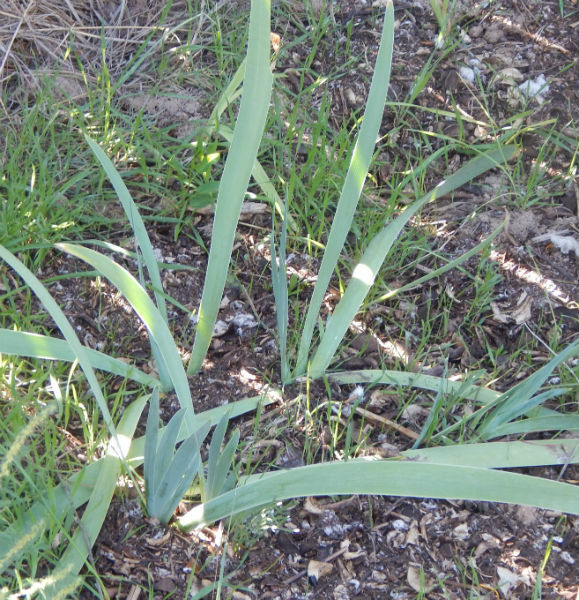 Leaves and roots are both trimmed when digging and dividing irises, to reduce transpiration losses, to reduce demands on the already disturbed plant, and to make them more stable in the ground when replanted. Leaves should not be trimmed on established plants that you are not digging and dividing. I don't know how this practice got started, but it is not recommended. As long as leaves are green, they are photosynthesizing and producing food to strengthen the plant for winter. 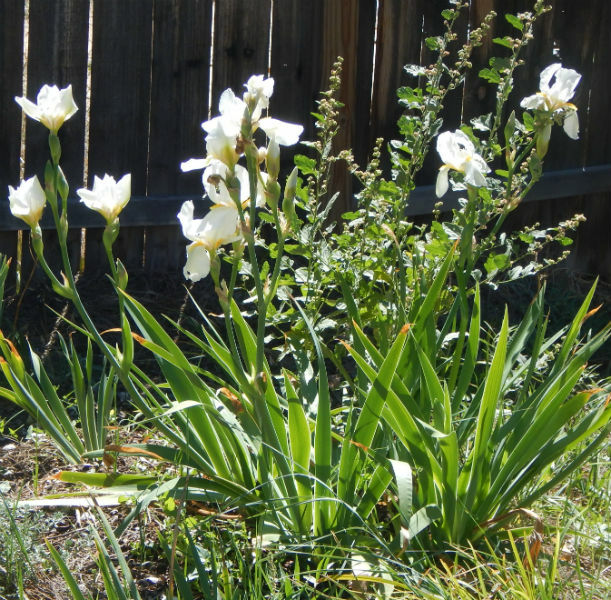 Trimming is not terribly damaging; the irises will survive it and still bloom next spring, but why set them back, even a little? I think some people like the tidy look of a neatly trimmed iris bed. (To be honest, autumn foliage can look pretty ragged and tired.) But I have enough to do in the garden just keeping up with chores that actually help the plants do better. I have no interest in doing a chore that makes them do worse, just for the sake of appearances or tidiness. An exception might be the foliage seems to be getting diseased, or if you are worried about possible rot or losses and want to get more light to the soil and air circulation around the fans. Mostly, though, such problems should be addressed by planting with proper spacing, and providing good summer care. Autumn and spring are when irises are in most rapid growth, so it is good to support them at this time of year with ample water and nutrients. As explained in an earlier blog post, there are good reasons to avoid synthetic fertilizers, especially if you have not had your soil tested and are not addressing a specific nutrient deficiency. I do apply a layer of partly composted mulch in the autumn (I usually try to do this a month or two before first frost), and sometimes also sprinkle on a blend of organic fertilizers. This encourages the soil life and improves soil structure. Since I also do this in spring, there is a more or less steady flow of decomposing organic matter into the soil. Autumn is a good time, because instead of drying out in the summer heat, the layer of organic matter will stay moist, and winter snows and temperature swings will help break it down. If you are in a cold-winter climate where you use a heavy winter mulch to prevent heaving, it should not be applied now. Wait until the ground has frozen and winter is here to stay. I collected seeds this summer. Should I plant them now? Hybridizers grow irises from seeds (made mostly from planned cross-pollinations) to create new varieties, and sometimes hard-to-get iris species are available as seeds through seed exchanges. I plant my seeds around the time of first frost.This blog post covers all the basics of growing irises from seed. If you've never grown irises from seed before, it can be quite fun and interesting! A few words to the wise, however: named iris varieties do not come true from seed. Also, it takes about three years to get a blooming-sized iris from seed. 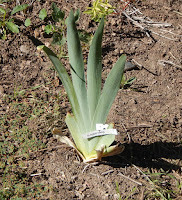 So this is not an easy or inexpensive way to get more plants of your favorite irises. 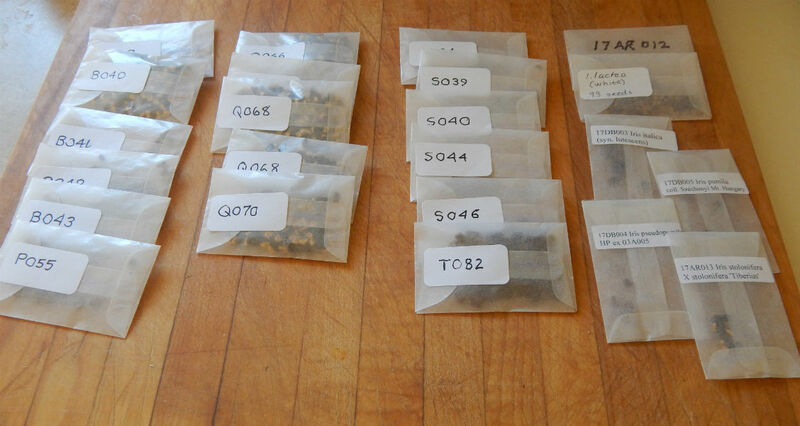 Division or purchasing additional rhizomes is the way to do that. Also, keep your seedlings separate from your named varieties. 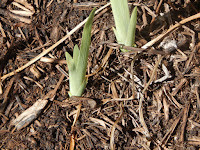 (If you plant seeds in the soil, that spot may be sprouting irises for a number of years. Do not plant named varieties there next year!) It creates trouble for future iris lovers if you get named varieties mixed up with unnamed seedlings, or circulate your seedlings among friends. Have fun, but be responsible with the plants you create. 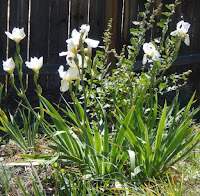 Some irises rebloom in the autumn after their normal spring bloom, and these can be a real joy at this time of year. September and October is the peak time for rebloom in most parts of North America. 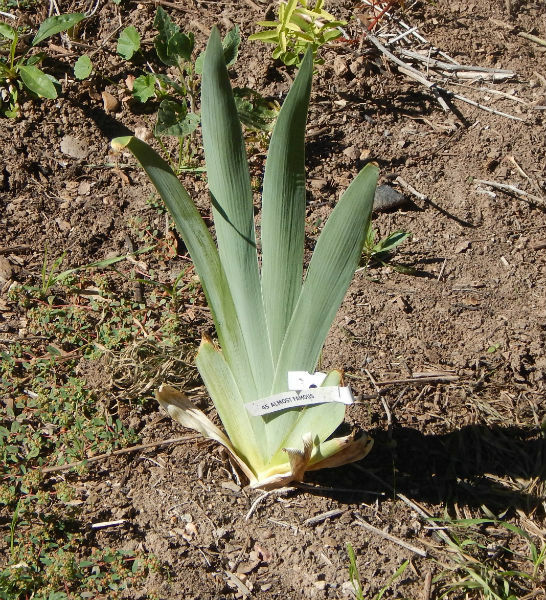 Different rebloomers are suited to different climates. If you want to start building your own collection to enjoy, check with the Reblooming Iris Society or with iris growers in your area. Rebloomers need water and nutrients during the summer and autumn, so do not slack off with your garden chores as the season wears on! This is good advice for all your irises. It is tempting to "let things go" and fend for themselves as the days grow shorter (we all run out of steam at some point), but if you can give your irises the same level of care in autumn that you do in spring, they will thank you for it!